When we first opened 15 years ago, customers began asking us for Olneyville NY System Hot Wieners. We started selling the authentic spice mix soon after that, and have since sold tens of thousands of packets. It seems the customer IS always right! 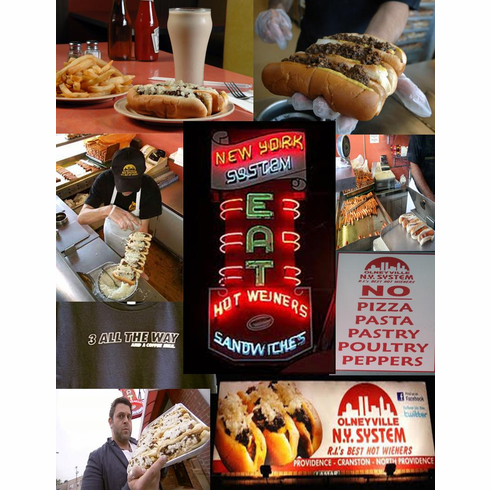 The Olneyville NY System has been using this recipe since 1946, (when they moved here from NY, hence the name) and there's nothing else like it anywhere! Each packet of spice mix makes three 1 lb. servings. If you visit their restaurant in Olneyville, you'll see that not much has changed since 1946, and they work hard to keep it that way. The commitment to tradition is one reason Olneyville NY System was named the 2014 James Beard Award recipient as an American Classic. We couldn't agree more, and are pleased to offer their new product line, exclusively at Only In Rhode Island.